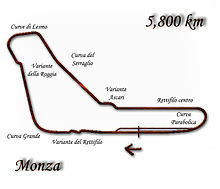 Formula One returned to the Monza circuit after a year's absence; the year previous's Italian Grand Prix had been held at the Imola circuit. The race would be known for the first time a Toleman-Hart qualified and finished in a race with Brian Henton qualifying the car in 23rd place. When the race started, pole-man René Arnoux fell back to third while Prost and Reutemann battled for the lead. Behind, Didier Pironi was fourth after overtaking four cars on the run up to the first chicane. Pironi continued his charge with Reutemann and Arnoux soon behind him. As his opponents dropped behind, Prost increased his lead and would keep it for the rest of the race. Jacques Laffite also made an excellent start, and was running third when he retired from the race with a puncture on lap 11. On Lap 19, John Watson lost control of his car at the Lesmo and smashed into the barriers at high speed, igniting a small fire at the back of the car. His McLaren's engine tub broke off from the car and debris littered the track. Michele Alboreto, who was behind Watson, crashed into the broken off engine, while Carlos Reutemann took to the grass and brushed a barrier whilst avoiding the accident, losing a place and sustaining minor damage. Watson escaped unharmed. As the race reached the halfway point, the standings stood as: Prost, Jones, Piquet, Reutemann and de Angelis. In an incredible case of misfortune, Piquet's engine blew on the last lap, promoting Reutemann into third and turning the tables for title hopes of the two. The Brazilian, however, was able to score a point as the sixth driver to have covered the entire race distance. Andrea de Cesaris, suffered a puncture on the last lap. Haunted by the trauma of nearly killing mechanic Dave Luckett in a previous race, Siegfried Stohr crashed his Arrows during the qualifying session. He ultimately decided to stop racing and started a successful motor racing academy. Nelson Piquet was running 3rd when his engine expired on the next to last lap. John Watson had a huge accident at the Lesmo curves when he went wide coming out of the second Lesmo curve, touched the grass and spun across the track, and his carbon-fibre McLaren slammed backwards violently into the Armco barrier, exploded and tore the car in half and strew bits of the car across the track, which caused Michele Alboreto to crash, who escaped with only a few bruises. But Watson walked away unhurt- proving the strength of the McLaren's carbon fibre construction. ^ "1981 Italian Grand Prix Entry list". ^ "1981 Italian Grand Prix". formula1.com. Archived from the original on 16 May 2014. Retrieved 23 December 2015. ^ "John Watson Accidente en Monza, GP Italia 1981". YouTube. Retrieved 2012-06-16. ^ "Grand Prix Results: Italian GP, 1981". Grandprix.com. Retrieved 16 June 2012. ^ a b "Italy 1981 - Championship • STATS F1". www.statsf1.com. Retrieved 18 March 2019.